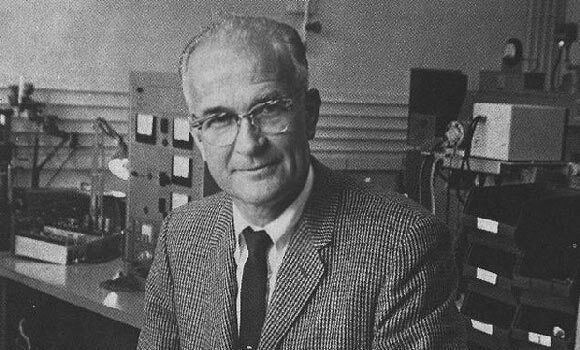 William Bradford Shockley Jr. was an American physicist and inventor who won the Nobel Prize for co-inventing the transistor. Shockley was born on 13 Febuary 1910 in London, but his parents were American and he grew up in California. His parents were both successful professionals; his father was a mining engineer and spoke 8 different languages, whereas his mother was a Stanford University graduate and the first female Deputy mining surveyor in US. Shockley completed BS from Caltech in 1932 and PhD from MIT in 1936. He joined Bell Telephone Laboratories in the same year where he remained until 1955 and served as the Director of the Transistor Physics Department. At Bell Labs, Shockley and two of his colleagues, John Bardeen and Walter Brattain, invented the transistor in 1947, for which they were awarded the Nobel Prize in 1956. Despite conflicts between the three, and efforts to work secretly without the knowledge of other members, the prize was eventually received and shared by all three. The invention of the transistor was a crucial discovery that marked the beginning of the electronic age as transistors are used in practically all modern electronic devices such as watches, calculators, cars, computers, washing machines etc. He took a leave of absence from work during World War II to act as director of research at Columbia University’s “Anti Submarine Warfare” Operations Group in 1942. He returned to Bell Laboratories in 1945 as director of solid-state physics research. Later in his life he was appointed as the Alexander M. Poniatoff Professor of Engineering and Applied Science at Stanford University. Dr. Shockley left Bell laboratories in 1954 to form the Shockley Semiconductor Laboratory. His domineering and autocratic style often alienated his employees, to the point that eight of his researchers resigned in 1957 and went on to form 65 new companies which stood in direct competition with Shockley Semiconductors. These companies formed the hub of what later came to be known as Silicon Valley. Dr. Shockley held more than 90 patents in his life for transistors, semiconductors and other computer related technology. Although he was often a difficult and demanding person, Dr. Shockley was a popular lecturer. He had an adventurous nature and enjoyed rock climbing in the Hudson River valley, where a route discovered by him has been named “Shockley’s Ceiling”. He was also an amateur magician and loved to plan and execute elaborate practical jokes. In later life, when Dr. Shockley was in his sixties, he frequently donated sperm stating that he hoped to replicate his genius by spreading his genes. One of the biggest controversies surrounding his work started when he proposed a genetic theory stating that blacks were intellectually inferior to whites because of their genetic structure, and for this reason, white races would always dominate black ones. He argued that a higher rate of reproduction amongst black races would lower the average IQ of the human race and would eventually lead to a decline of modern civilization. His views often made him unpopular amongst his peers and contemporaries. By the end of his life, William Shockley was alienated from most of his colleagues except a few select friends and his wife. His was even estranged from his own children, who learnt of his death through the media. Other than the Nobel Prize, Dr. Shockley received several others awards and honors such as the National Medal of Merit in 1946, Holley Medal of the American Society of Mechanical Engineers in 1963, honorary science doctorates from several prominent universities, and was inducted into the list of 100 most influential people of the 20th century by Time Magazine.